Coming off Before Midnight and Boyhood, Ethan Hawke is in line for some pretty premium roles. His career is in a resurgence, with prime-time parts being offered like they haven’t been in years. 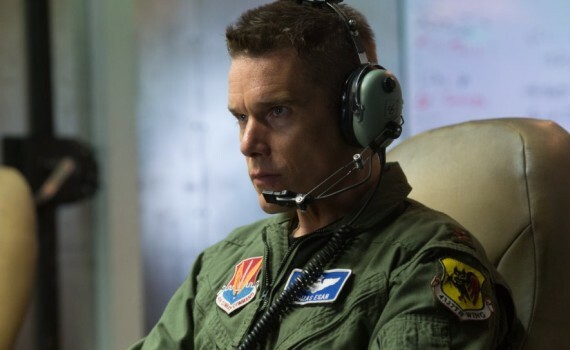 Good Kill is a film that I could imagine would have sought out a different actor were it to have come out a few years ago, but with Hawke currently a hot ticket, he got the job. Although, it should be noted that he’s worked with writer/director Andrew Niccol before: Gattaca in 1997 and Lord of War in 2005. Niccol is also responsible for S1m0ne, In Time, and The Host, while writing the stories for The Truman Show and The Terminal as well. None of those are amazing films, and, let’s be honest, despite his successes Hawke isn’t the most amazing actor either. So perhaps it won’t surprise you to know that this film slides right into the category of good but not great. Thomas Egan is an Air Force pilot stationed in Las Vegas. He has seen more active duty than anyone around, signed up for tour after tour, and loves the fear of flying a fighter jet over enemy territory. But now, he’s no longer in the air, but behind a desk. Egan is a drone pilot, the man behind the controls of America’s new war of terror. He remotely flies unmanned aircraft from his trailer on a tarmac in Nevada, dropping hellfire missiles on the heads of terrorists thousands of miles away. This modern war practice takes the glory out of combat, the thrill out of flying, and the passion out of a job that Egan used to love. Now he compartmentalizes the fact that he drives to the office and kills men all day, only to return to his suburban house, his attractive wife, his growing children, and pretend that he’s a proud soldier serving his country. It’s going to be difficult to talk about the subject matter of the film without getting into politics, so let’s get that out of the way. The movie is about the drone program, its merits, its morality, and its function, presenting us with some harsh truths about a complicated subject. Whether you are right-wing, left-wing, Republican, Democrat, a fierce patriot, or a peaceful hippie, this type of warfare is happening. It’s the most efficient way to kill “bad guys” and America is a leader in the use of this tactic. We can stand on either side of the argument about whether we ought to be or not, but this film presents the reality of the situation, and then puts a human face on the problem. The script & characters are designed to portray different viewpoints, from the propaganda for to the classic arguments against. At times it even feels a bit too fake in that way, as if the lines were written by college students preparing for a debate. But the subject offers its own true drama, the topic is open for discussion, and the truth behind the story becomes the best part of the film. Ethan Hawke’s character epitomizes the struggle to decide whether this type of war is just, evil, or somewhere in between. And as he hunts for an answer, he also tries to live a normal life, getting along however he can while this great problem swirls around him. In that way, he’s a representation of us, our doubts, and our disagreements. So the bones of the film are solid, it’s a theme we need to explore, and I’d be glad to watch more dramatic renderings of this type. It’s the execution of the movie that bothered me and kept me from loving it. Hawke was only OK, and plot points like his draining a bottle of vodka down the bathroom sink have been done to death. He didn’t feel original and I never completely rooted for his character. Bruce Greenwood was pretty strong, though his lines always seemed completely manufactured. It was January Jones who really threw me off. She was horrible in every scene, and I’m beginning to wonder if she has the ability to change the expression on her face. She definitely gets cast for her great looks, and I predict that she’ll never make it much farther than that. Good Kill was a fascinating presentation of a current issue, but not a phenomenal film when picked apart. I imagine that audiences will enjoy it, since it’s not long, feels pretty typical, has to do with war, and stirs emotions. Just don’t look too deeply into the acting or the dialogue if you can help yourself.